There are many equally important facets of the Keystone XL and tar sands opposition in which communities are waging non-violent direction actions. These include Honor the Earth's Ride for Mother Earth, last year's cross-movement #ForwardOnClimate Rally in Washington, DC, and the petitions and campaigns urging the public to seize their final opportunity and submit comments to the Secretary of State on the Keystone XL pipeline. One such action is currently taking place in Missoula, Montana, where an Indigenous organization is leading the charge by literally stopping climate chaos and environmental destruction in its tracks. Indian People's Action (IPA) is an Indigenous-led organization aiming to build the voice and power of Montana's urban Indians. To do this, they rely on strength in numbers, and organize direct actions to achieve systematic change to improve the health and lives of their Indigenous membership. In early December 2013, IPA's Director Michaelynn Hawk (Crow) and other citizen groups learned that the Oregon-based company Omega Morgan intended to haul several megaloads—trucks typically the size of, or slightly longer than, a football field—of tar sands mining equipment through Missoula on their way to Alberta, Canada in January 2014. Immediately, and not for the first time, the groups began organizing. IPA, which had brought Moccasins On the Ground--a non-violent direct action movement to protect sacred lands and waters from environmental abuses--to Montana for a 3 day training in August 2013, became a driving force behind the push to stop the transports. The reason behind IPA's determination to do their part to stop these hauls is that, simply put, megaloads present a mega problem for our future. According to the Tar Sands Solution Network, "If we extract all the known tar sands oil the Earth's temperatures will rise substantially, leading to complete climate catastrophe. [Additionally,] development also pollutes the land, air, and water with dangerous levels of toxic chemicals in northern Alberta and along leak-prone pipeline routes that carry this highly corrosive cargo through communities and waterways across North America." Those communities, including First Nations communities in Canada, are having their rights infringed, their health and well-being jeopardized, and the lands and waters they have relied on for traditional food sources destroyed. The protests took place in the late night and early morning hours of January 22-24. 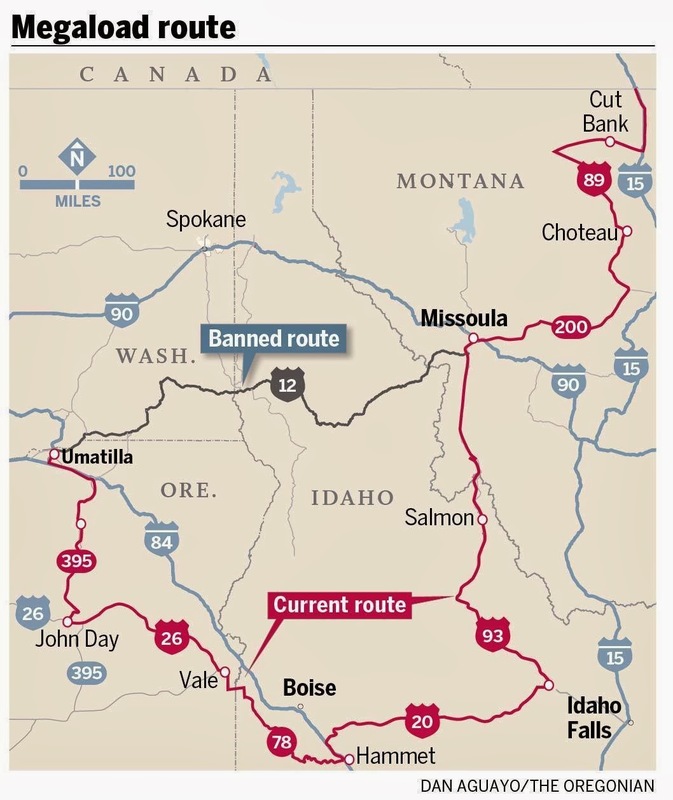 In total, three megaloads drove through the Missoula route. On January 22, the first load was greeted by 40 protestors, most of which were IPA members. "It was our intention to enter Reserve street together in front of the megaloads and halt the movement of this tar sands-bound equipment however long we could by leading ourselves and our non-Indian allies in a traditional round dance, which is a form of prayer and a symbol of unity, in the middle of the street, while carrying our signs with words describing our opposition..." wrote IPA's Police Liaison George Price in his editorial comment to the Missoula Independent. The round dance, as well as the arrest of an elder ally, delayed the trucks passage. A second, smaller megaload quickly passed through the city on the following evening at speeds too fast to allow for safe and responsible blockades. 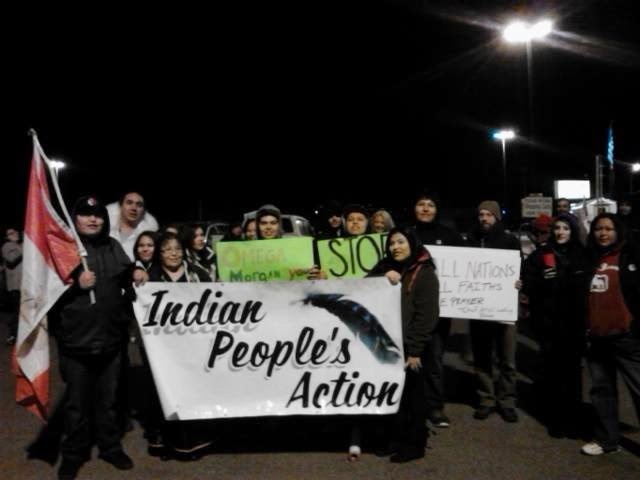 IPA and allied groups like Blue Skies Campaign, Northern Rockies Rising Tide, Spokane Rising Tide, and Wild Idaho Rising Tide held a second, larger action on January 24, where Indigenous members numbered roughly 60 of the 70 protestors. During this action, IPA led a round dance that stopped the megaload transport for 12 minutes. This was then followed by a speech by IPA member Charles Walking Child (Anishinabe), which caused further delays. Finally, three elder women allies held up the load by sitting in the street and refusing to be moved. One was arrested, the other two cited. Each of these tactics—distributing press releases to the media, holding signs, handing out informational leaflets, holding a round dance, giving speeches, the arrests and the citations—played critical roles in delaying the transport, thereby increasing the cost to the company hauling the loads. They also served as a way to increase public awareness of the megaloads and tar sands in general. These direct actions provided an opportunity for IPA and allied groups to focus public attention on climate change and the destructive practices of the extractive industries, while making it clear that Indigenous and non-Indigenous communities alike would stand alongside one another to stop fossil fuel projects where they could. Indian People's Action continues to keep an eye on and prepare for any future megaloads which plan to travel through Missoula en route to Alberta. We at Women's Earth Alliance encourage our friends and partners to learn as much as you can on this critical issue, including more about the many Indigenous communities in Oregon, Washington, Idaho, Montana and elsewhere currently standing on the frontlines of megaload protests, and then go forward and share that information with your friends and partners. The above article was reviewed by and posted with the permission of Indian People's Action. The Women's Earth Alliance Advocacy Network has allied with Indian People's Action to facilitate advocacy support around their efforts to oppose tar sands oil.